Often, the "little things" add up and can have a big impact on how your teen feels. They form what feels like a mountain of problems that's just too big to climb. However, learning to take on challenges step by step can help your teen cope with and manage stress. It's important to know what teens can deal with on their own or manage with an adult’s help. Teens can develop coping skills to help them solve problems. When teens develop these skills, they are better able to manage frustration, anger, and anxiety without drugs and alcohol. Which stressful situations in your life can you control and which ones that can't be controlled? Focus on the things that you can change. For example, your teen can't change the fact that they didn't make the sports team this year. But they can practice their skills and prepare for next year. Trying to solve too many challenges is hard, but taking them one at a time makes them easier to manage. 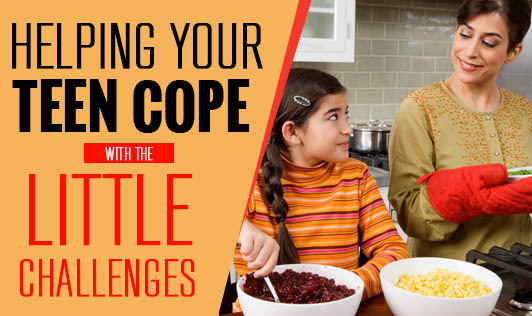 Helping a teen focus on each challenge, one at a time, can keep them from feeling overwhelmed. Start by concentrating on the first problem and discuss the parts or steps of what happened. Talk about ways to prevent this accident in the future. Then, move on to the next challenge and possible solutions. Focusing on one problem at a time not only helps prevent that problem in the future, it gives your child a sense of control. When you eat right, exercise, and get enough sleep, you feel better! Make sure that your teen isn't overloaded with activities. They should take time every day to slow down and do something they enjoy, even if it is just for a few minutes. Anger is a normal emotion and it's what we do with anger that determines if it is helpful or harmful. For your child and you, learning a new skill, taking a walk, or doing something that releases energy can give you time to calm down. Either one of you can ask for a "time out" to think through the problem before finishing the conversation. One of the best things your teen can do is to talk openly to a friendly, an understanding listener who remains calm. Listen to your child. They may not want your advice, but just being there for them and listening to what they say can help them cope. You can act as a sounding board so your child can "hear themselves think," which can help them solve their own problems. By teaching your child to cope with life's twists and turns, you send them valuable messages like, "I love you", "I'm here for you", "What matters to you matters to me", or "You can do it!". As your teen learns to manage the "little things", he becomes better at tackling the bigger ones.